The last design of coach to be considered in this series of articles is the British Railways standard Mark I, which was produced in two styles, the (mostly shorter) non-corridor version, and the more numerous, longer, corridor type. 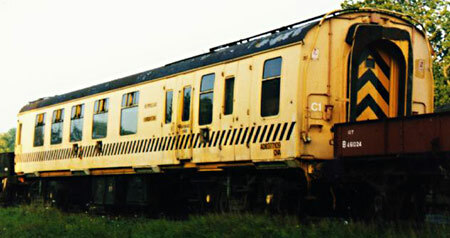 The corridor coaches appeared in earlier and later forms, the latter being distinguished by external aluminium window frames, and better anti-corrosion treatment. 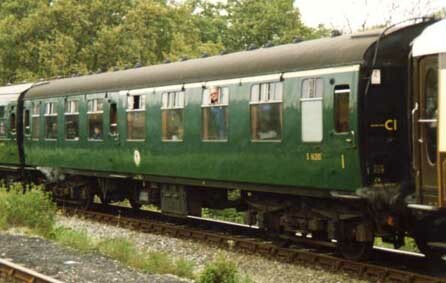 The Bluebell's first Mk.I coaches were the three 1950s' ex-King's Cross suburban non-corridors which carried many of our passengers in the 1970s. This allowed the Carriage & Wagon department to concentrate on the overhauls of our older Maunsell and Bulleid stock. However, by the early '80s they were showing their age. With the main weakness in Mk.I design being the door and door-frame structure, the maintenance of such coaches with many doors (and small, leaky, windows) per side was found to be beyond our ability. Their earlier design of windows also left much to be desired. (See article in Bluebell News Vol 28 No 3.) These three coaches were sold in 1986, and we should congratulate the North Tyneside Railway, since the recent restoration to traffic of CL No 43010 means that they have now completed the overhaul of all three of these coaches. Having learnt the hard lessons of the shortcomings in the earlier Mk.I designs, our subsequent Mk.I acquisitions have been of early 1960s build, with the improved windows and mainly with cast aluminium doors. The first to arrive was Buffet car No.1818, entering service in 1984 after an internal renovation and a repaint. Others followed, in particular more catering vehicles, two CKs (composite corridors) and three SKs (second corridors) to relieve the weary Bulleid stock. Then, in 1993, came the biggest influx, when the travelling college train was purchased complete. Apart from providing three TSOs (tourist open seconds), many of the vehicles of this train were intended to be broken up for spare parts, but it now appears that a few will also remain in various functions on the railway, with others sold on to other organisations. The continued operation of any Mk.I coach is only possible if it is overhauled and maintained in a watertight and corrosion-free condition. To secure the long term future of a Mk.I coach thus requires considerable preventative maintenance, with the accent on preventing water penetration. Failure to do this results in progressively advancing corrosion, which becomes more difficult to repair the longer it is left. For example, Buffet car No.1818, having operated for nine years, then required structural repairs to its door pillars. On its initial restoration to traffic a substandard previous repair had gone unnoticed, allowing water penetration behind the gutter which caused serious structural corrosion. Another decade on, and the vehicle, having been in use on the Bluebell for 20 years, was 45 years old, and in need of major structual repairs at its ends and roof, which it received in 2005/6. Corridor Second No.25728, which on arrival was thought to be the best of the three SKs has, in the intervening three years, demonstrated another weak-spot in the design. The seal between the gangway and the end of the coach had failed, leading to corrosion of the end sheeting and the subsequent ingress of water. The end-loading pillars, quarter-inch thick steel channels, had rusted almost completely through at the bottom. 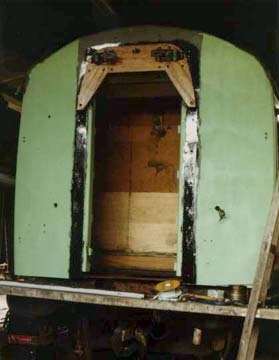 To gain access to repair these required not only the partial dismantling of the coach interior (including a section of the floor, which was, as usual, partly rotten in any case), but also the removal of the gangway connectors. This, together with the attendant sheet-metal repairs and renewed woodwork, added up to a fiddly and time-consuming (18 month) job. Other weak-spots that have been identified include the top corners at the ends, and the gutters, particularly of the Derby-built coaches, where, as with the gangways, poor quality sealant leads to water ingress and corrosion. It becomes important to remove and re-bed the gutters and window frames if it becomes evident that the rivets or sealant have failed. It is, however, the condition of the door pillars which is the limiting factor on safety grounds, and will, if corrosion is unchecked, lead to the demise of any Mk 1 coach. One only had to look at the Queen of Scots coaches, towards the end of their loan to the Bluebell, to see this! Without an increase in the resources of the C&W, we estimated that we shall be able to maintain no more than 7 or 8 Mk 1s in traffic in the medium/long term, on the basis of each one requiring major work each decade. We are now fortunate in having been able to improve facilities and our skill base in this area. 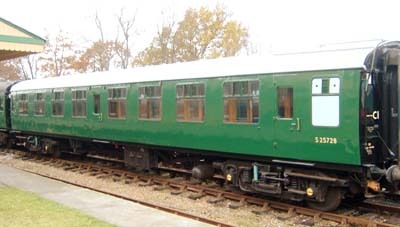 During 2008 it started to become apparent that these 55-year-old carriages were starting to suffer from a breakdown of the insulation resistance of their wiring, and electrical work is now required on many of the vehicles. It has to be remembered that this work was no-where near being required when the first overhauls were undertaken on carriages which were then only 25 years old back in the 1980s. The rest of this article describes briefly the history and condition of each of our Mk 1s. References are provided for previous Bluebell News articles providing more detail on a particular coach. Corridor Seconds (SKs) Nos 25728 (maroon until 2003, now green) and 25769 (green). These have both received major structural repairs, (ends and two doors on No 25728 and door pillars on No 25769) in addition to the rebedding of windows and gutters. The interiors have been "de-furbished" with the replacement of the modern florescent lighting, and they have both received an interior overhaul, although the seats retained their modern moquette. (BN Vol 34 No 4 and C&W reports in 1994/5.) A start has now been made on replacing this, and seven compartments of 25769 are now in more appropriate "Trojan" moquette, although this coach is now withdrawn being in need of wheel turning, and its long-term future on the railway is being reconsidered thanks to the overhaul of other carriages which are more operationally useful. SK No 18752 (NSE livery) was used in the relief set. As the only one of the three SKs (corridor seconds) not to have received a structural overhaul, it has been rendered surplus by the arrival of the Ex-Travelling College open seconds, and was sold in 1995. Another SK (No 24458) was obtained in 2007. This is in relatively poor condition, and will require extensive repairs both to structure and interior before it can be used, but is now expected to be disposed of. Open First (FO) No 3116 (maroon) was purchased from the ex-SLOA/FSS main-line set, and subsequently patched up externally. 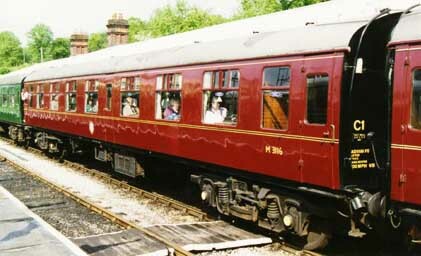 It was used for some years as part of the relief set for peak days only, then regularly, providing the first-class accommodation in the maroon set in the late 1990s. Whilst the door pillars held out, it continued in service, but its days were clearly numbered. It moved on to the Mid Norfolk Railway, after 15 years use on the Bluebell, and was replaced in service for a couple of years by another FO, on loan to us from the Great Central Railway. Because of the commercial value of first class accommodation on our Santa Special trains each December, No.3064 arrived in November 2007, on loan to the Bluebell from a member, following a contract overhaul. Open Second (SO) No 4824 (carmine and cream) was obtained in overhauled condition in 2007, and enters traffic in the near future after further work and re-painting. The 2+1 seating of the SO design makes it very useful for our highly successful cream tea and fish-and-chip trains, and this coach gives us the extra seating capacity needed for Santa and Thomas weekends, taking pressure off the C&W department in the event of another coach needing maintenance over those periods. Brake Second (BSK) No 35448 (Maroon until 2002, now green) provides much-needed guard's accommodation. It was in appalling structural condition at the brake end, although it was reasonably smart inside. In view of its low seating capacity (24, or 32 with the arm rests removed, which they have been at the same time as the vehicle was re-trimmed into BR Trojan moquette) and structural dilapidation, it would not be an obvious contender for a major overhaul, but none the less has received considerable attention, and should run for many years to come. It is considered by the experts to be amongst the best riding coaches on the railway! Restaurant Unclassified (Buffet) RU(B) No 1987 was purchased out of departmental service to be broken up for spare parts. Its interior was bare, although retaining the partitions and original interior in the passenger area, and it had electric heat and air brakes. It was stored for a decade pending a decision on its future, and in 2003 was sold to another railway. Brake Composite (BCK) No 21271 was the last in the main run of Mk.1 arrivals, coming in September 1996. It is one of the very last batch of BR Standard Steam-Hauled coaches built, and is in excellent structural condition. It was used on BR in departmental service. For a short time on the Bluebell it continued as a departmental vehicle for the Permanent Way department, but is now stored awaiting restoration. Components to replace the missing interior are already in stock, having come from another coach in the same batch. Ex-Travelling College Tourist Open Seconds (TSOs) Nos 4921, 4941 and 4957. These were used as classrooms on the Travelling College, and were thus little altered inside. 4941 and 4957 have been in regular use, having been painted green (and 4957 was subsequently been repainted maroon, until repainted green again in 2003), although their steam heat systems were not made fully operational until 1998. 4957 has received some structural repairs, which 4941 now awaits. 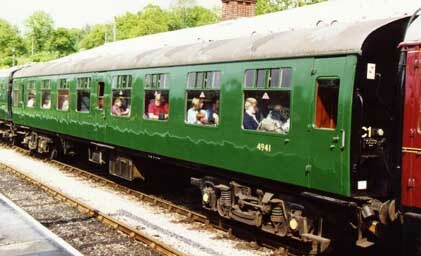 The third, No 4921, had a seating bay removed to accommodate a photocopier. Restoration for passenger use took a protracted time, and with our Bulleid and Maunsell Open Thirds able to satisfy our requirement for this type of vehicle in the longer term, following the conversion of 5034 (below), the vehicle was sold in November 2000. The other two had a few years left in them before the crunch arrived, when 4957 required structural repairs. In addition to door-pillar repairs, full end overhauls, requiring removal of the gangways, were necessary. In addition a section of bodyside was cut out and replaced, making good some longstanding accident damage which had never been properly repaired on BR. The interior though remains largely in its converted Travelling College condition, with an extra partition. Two other ex-Travelling College coaches were repainted in Pullman colours, in BR Western Region style, to work with our Pullmans. Both had steam heating reinstated. The body condition of these coaches was otherwise as would be expected of any thirty-four year-old vehicle. The former BCK was used as the guard's brake vehicle for our Golden Arrow train. With the entry into traffic of the LMS six-wheeled guard's van, it was released from this duty, and sold. TCL99168 was repainted as W25778, the "New Century Lounge". It proved popular with parties but it was difficult to find a use for the small saloon, which, although occupying nearly half the coach, was too narrow. This coach has also now been sold to another railway, who have now sold it on to a third, and it has now ended up having been converted into luxury holiday accommodation attached to an old railway station. The ex-Travelling College staff coach found ready use as the replacement dormitory coach at Sheffield Park, although it has already demonstrated that a coat of paint will not prevent the gutter or windows leaking. Of the six student dormitories, one has been stripped internally (TCL99161, ex SK 25871) and replaced the Maunsell nondescript brake as the Horsted Keynes Carriage Book-shop, four (TCL 99160, 162, 163 and 164) have been sold (without their Commonwealth bogies which we are retaining as spares) and the sixth (TCL 99165, former TSO 5034) has been rebuilt as special use saloon, with one end restored to its original TSO layout, with double-doors and a wheelchair lift fitted at the other end, giving wheel-chair access to a multi-use open saloon. The structural bodywork of this vehicle was considered to be in better condition than the three other Mk.1 TSOs. 4941 may be similarly converted in the future. 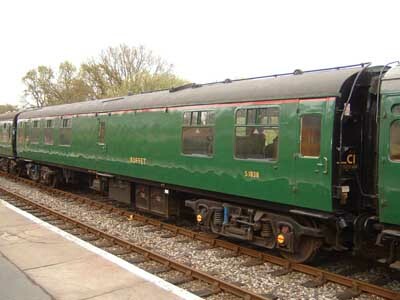 Only one of Mk 1 coaches from the Queen of Scots train remains on loan to the railway. It should not be considered as part of our "fleet", and is arranged for sleeping accommodation for staff, and used as such at Sheffield Park. (See BN Vol 34 No 2). Conclusion: The Mk 1 design, for all its problems, is a fine looking coach, with good passenger amenity and a durable interior. Those coaches which are thoroughly overhauled and maintained in a watertight condition should serve us well for many years to come. 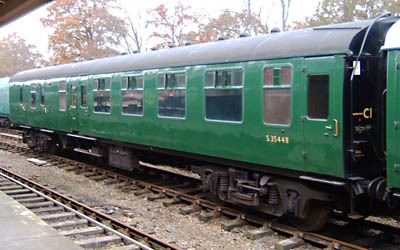 They are the last "traditional" steam-age coaches available from BR service. It should be remembered that, when they arrived, many were over 30 years old, and holding up rather better than the Bulleids, the first of which, on arrival, were around 20 years old. Whilst some are undoubtedly to remain serviceable in the long term, it is to be hoped that some, whilst helping cope with the immediate demands of an extended railway, will in the longer term be replaced by restored Bulleid and Maunsell stock. On to the final article in the series, in either its original form or as now updated. Copyright © 28 January 1996.